This is a C++ game I created using RtAudio and fluidsynth as an exercise in using C++ for a complete game design, including visuals and audio handling. The game is designed as a first person shooter, where you are at the center of a circular staff. You can control the rate at which the bar pointer moves over the staff and at any point can “shoot” notes at the staff by singing them. 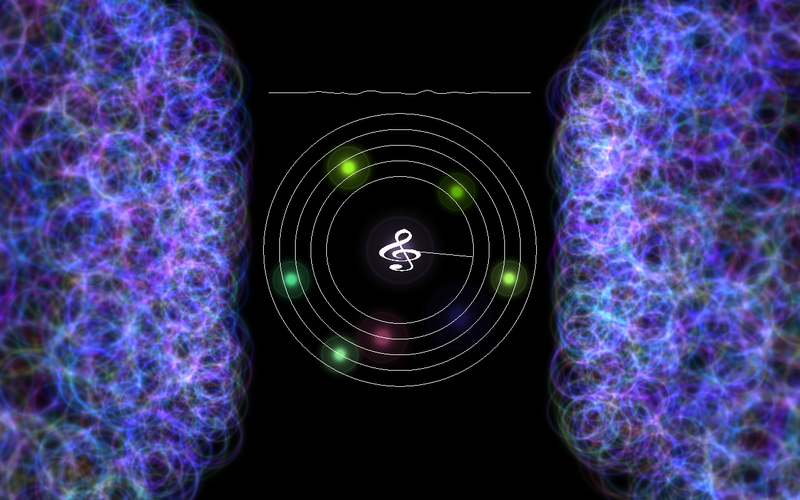 The f0 of the singing note is identified and a colored orb is shot at the staff and keeps playing. At any point one can add and delete notes. What I found interesting at the end of this exercise was the serendipitous nature of the melody was mainly because of the variable speeds of the rotating staff. A well ordered set of notes when introduced at randomly varying times led to interesting perceptual meanings. Notes : All the sounds were created using fluidsynth. All the audio handling was done using RtAudio and graphics using OpenGL in C++.